Equitation science promotes an objective, evidence-based understanding of how horses learn, and how to train them accordingly. It promotes the welfare of horses during training and competition by applying valid, quantitative evidence based methods. Equitation = the art & practice of horsemanship & riding. The Diploma of Equitation Science offers new and exciting career opportunities in the growing field of equitation science, both in Australia and internationally. 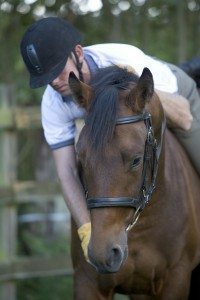 Providing students with highly practical skills and in-depth knowledge of all aspects of horse handling, coaching and training, graduates are equipped with increasingly sought after skills in equine management, and are well placed at the forefront of evidence-based and ethical equine training practices. For a list of the units and their codes, download the course brochure. As a student of the Diploma of Equitation Science, you join a growing community of like-minded horse professionals and enthusiasts. Students are automatically enrolled in a discussion forum to share in and contribute ideas during their study. After completing their Diploma, graduates are invited to join a private group to stay in touch with fellow students, former graduates and the team at Equitation Science International. Graduates are also invited to attend bi-ennial trainers conferences. The inaugural conference will be held at the Australian Equine Behaviour Centre in 2017. Equitation Science International is an approved VET Student Loans provider for Australian students enrolling into 10070NAT Diploma of Equitation Science. The VET Student Loans program (otherwise known as VSL) offers greater protection for students and focuses on courses that address industry needs, creating better opportunities for employment. VET Student Loans offers income contingent loan support to eligible students studying certain diploma level and above vocational education and training qualifications. The ability to ride a horse in all four gaits demonstrating control and balance. Students are also required to be able to jump small obstacles. The cost of the entire course is AU$8,900.00. Pay per unit and payment plans are also available. VET Student Loans are now available for Australian Students. Recognition of Prior Learning (RPL) is the acknowledgment of skills and knowledge obtained through formal training, work experience and/or life experience. The purpose of this process is to identify and assess previously acquired skills and knowledge against the required competency standards. Course participants applying for RPL must provide evidence to the satisfaction of ESI. This evidence must clearly indicate that the applicant is able to demonstrate all of the required skills and knowledge for the unit in question. Information and documentation regarding the application procedure for RPL and/or Credit Transfers will be made available to all participants upon request. ESI units (ESIHTP501A – 504A) are not available for RPL. *Australian workshops only. For international workshops (UK, CA) contact ESI. Students must enrol with ESI and have completed ESIHTP501A, and ESIHTP502A (theory only) prior to arrival. During their first week of stay, students will complete the practical component of ESIHTP502A, and the remaining ESI units (ESIHTP503A, ESIHTP504A) need to be completed before the end of their placement (minimum 3 months). Students must bring their own laptop computer and be prepared to continue their online study whilst working at AEBC. The remaining additional units can be completed whilst at AEBC, or online at home. Applications for working pupil positions must be submitted prior to enrolment.